A touch of compassion for Philippine atheists . . . It struck me that atheists must be going nuts right now. And maybe Muslims, too. Or how about INC members whose new arena can’t come close to matching the grab power of Pope Francis on wheels? Face it, this is a celebration by the super-majority of 83 percent, and it is totally of the Philippine style. Loud, robust, self-involved, screams detached from faith, but somehow sealing the baying crowd tighter in faith. This is a bald-headed white Manny Pacquiao sitting at the right side of God Himself, packing Jesus in his heart and humanity in his soul. I feel sorry for atheists. They have no marketing department. They have no logo, no idol, not even a flag to wave. All they have is a belief system that the brain is better than all this faith in outer-world powers. They’d convince a lot more people if they could answer some of the more perplexing of our scientific questions. Like, really, what is beyond the universe? And what is that stuff that we can’t see that makes up most of the mass of the universe? The world is rich in mysteries and phenomena and atheists can only stammer . . .
It’s like dogs can hear sounds that human ears are not equipped to grasp. The human mind also seems deaf to a lot of understandings. Yet, atheists, like the religious, push their belief system on others with passion and a hard-headed need to convince . . . I somehow think there are a lot of drunk atheists this week, drowning their sorrow and impotence in the overpowering machismo of a Pope with charisma, clout and . . . yes . . . compassion. On that point, I think alcoholism is a faith, too, a belief system that putting the brain into a trance will make the pains go away, at least until the morning hangover. It’s icon is the bottle, and it comes in many elegant shapes and styles. Womanizing is also a belief system, but let’s let that one go for now. My own belief system is that there is no proven belief system, and it is thereby enriching to partake of the faithful of any peculiar system celebrate their unity, praise their heroes, and strive for a better way of living. Muslims are likely not getting drunk, but I fear that a lunatic fringe is incensed by this display of belief that is not theirs. And so they are plotting a bloody revenge in the dark, satanic corners of their animalistic minds. I hold compassion for Muslims who do not feel inclined to force the rest of the world to follow their model, other than by kind living. Muhammad Ali and Kareem Abdul Jabbar are my kind of Muslim. It often seems to me like every Muslim with a gun has a tablet full of commandments and he is not afraid of using either one to subjugate the infidels . . . including the 83% out celebrating today. Like, in some countries, I cannot say Allah, and in France I can’t draw a picture of Mohammed. In Saudi Arabia, my wife can not drive and she would get stoned if she looked at Coco Martin with that somewhat lusty look I’ve seen her acquire when facing his televised presence. What’s an atheist to do in the face of that affront to intellect? I feel sorry for atheists. My heart goes out to them even if they only want my mind. They are diminished by this grand display of irrational love. ← Does mercy and compassion extend to the corrupt? I’m not a believer myself, but I am neither drunk nor disturbed, though I might be grumpy were I stuck in the traffic. I also don’t see any need for a marketing department: I have no interest at all in promoting my belief or lack thereof to the masses, or to anyone. I’m willing to discuss the issues, as long as the discussion stays civil, but I’ve no interest in preaching or being preached to. Those who want religion, or feel that they need it, are quite welcome to it. I would appreciate it if they did not force it on others, but I understand that this is to some extent inevitable. Some Jehovah’s Witnesses once came to my door to convert me. I put on my most beatific smile and manner and said gently “sori po, satanista po kami dito”. They retreated. One copes with the intrusion. I of course do not speak for all non-believers, but neither does anyone else. What does disturb me is when a few power-hungry men manipulate the faith of the masses in an attempt to use the State to impose their will and agendas on those who they cannot persuade from the pulpit… but that’s another question, and mass fondness for the Pope does not affect it so much. I do not expect, for example, a surge of support for the CBCP or its political causes to emerge from this trip. People will have their thrill, and we will go on as before. A very rational perspective, indeed. Adept handling of the Witnesses. I also rebel against the imposition of values in ways other than teaching and preaching. I find beheadings a strange way to celebrate the faith. Interesting view that, once the excitement dies, both the CBCP and the people will go back to what they were doing. I hope not. I hope Pope Francis instills a sense of conscience, especially among the masses who will be voting in 2016. My own guess is that most of those present are more interested in basking in The Presence than listening to, let alone following, the words said… but that is just my guess. My guess is that majority of those who went to see the Pope even for a momentary glimpse went not to show the strength of their faith but to savor and relish the atmosphere of deep holiness and godliness of the Pope. The stories of the current Pope’s humility, modesty, unpretentiousness and self effacement has made him a living example of Jesus, himself. Jolly, copy this comment to the blog I just published, eh? Perfect. My only question is. Is it really believing in nothing? There must be something to believe in. As to what that something is called I do not know. I believe in many things. Gods and demons are not among them. ok I am very wrong saying believing in nothing. It’s actually quite common, if a bit unfortunate, for people to confuse atheism with nihilism. a yeah that is the proper word for it. thanks and sorry about that. no cell phone signal may mean no broadband connection for many regulars. Atheists have always been described as “all dressed up and nowhere to go.” Atheists will have no use for a marketing department, since it has no product or service to sell in the first place. To become an atheist is to believe there is no God. But that takes an act of faith in itself – not to believe. But just because it can’t be detected by our senses does not mean it does not exist. The more humble position is to say, “I do not know.” or “I am not sure.” And take it from there. The humbug atheists – Richard Dawkins, Hitchens are the lonely ones out there. But that poster above does a great disservice to the greatest minds of the past generations, without whom mankind would not have great strides in its development. Einstein and Sagan were curious intellectuals who pondered the universe honestly. Lincoln and Franklin co-founded one of the greatest nations on earth. Great writers like Twain, Hemingway and Hugo created works that are of great value till today. The genius of this Pope is he has opened the door to atheists who desire the common good. The genius of Francis is that he is a humble Pope. Now the CBCP political bishops . . . . Disbelief accommodates uncertainty quite readily. None of us really “knows” whether or not there is a God. Some choose to believe, some don’t. I have no issues with saying “this is possible, but I see no reason to believe that it is the case”. My own belief is that man invented God long long ago, when wiser elders needed some threat to force the strong young bucks to refrain from fighting each other and work for the good of the tribe. In the days of the primitive hunter gatherers, a social group that could keep the males of reproductive age from fighting each other would have a huge evolutionary advantage over those that could not, hence the evolutionary value of social control. How does one restrain and discipline the physically strongest members of the tribe? Invent big daddy in the sky. I do not care for fundamentalists and preachers of any sort, including those who preach fundamentalist atheism. I prefer to live, let live, and hopefully be let to live. I don’t believe also, the Pope to me is just another dignitary visiting another country and so no reason to grab a bottle because of that. To the believer, I say, keep your faith, but faith to me does not prove anything, and to say that “I have faith therefore it’s true” is quite not my tenet. Am I an atheist? What’s in a name? Does not matter to me. Bert, you are my brother . . . Au contraire, atheists are amused at the spectacular display of madness and insanity. Like all religions, idol worshiping in Catholicism is founded on vain hopes. It’s a church so rotten in corruption, pedophilia, and hypocrisy the intellectual Ratzinger has to resign because he could not cope with the stink. Pope Francis may have the gift of charisma but his populist charge could only go so far. Resistance from within the conservative ranks of Catholics on issues like gay and women rights and anthropogenic global warming could widen the fissure of disunity. Will he be able to succeed in reforming an increasingly irrelevant organization? That’s the two dollar question. And that is where mercy and compassion comes in. His church need a good measure of it. One of the things that perplexes me as I listen to Pope Francis as he speaks of many faiths and . . . I’m not sure of his exact words . . . but something to do with respecting people who believe differently than we do which seems to be a form of compassion and peaceful acceptance of others, as individuals. At the same time, he sees his priests as having a missionary role, which is obviously to bring more disbelievers into the Church. The thing that strikes me, as I read your words which tend toward the side of harsh, I wonder as to the inclusiveness of atheism. It almost seems like it is set up that any believer is wrong-headed, maybe even insane, and what we have is a nation of 80 million crazies. Well, I have a hard time buying that. I think there are 80 million good people looking for answers and a few leaders who are political and even vengeful. But my basic question is, is atheism inclusive or divisive? Atheism is as inclusive or divisive as atheists choose to make it, just like religion. The more people become convinced that they have the right to impose their beliefs on others, the more divisive they get. That’s not a function of the belief in question, it’s a function of the attitude of the believers. You’re having it backwards Joe, it is organized religion that divides humanity. Because Catholics, for example, are atheists to the gods of the Hindus or the Muslims, its history is filled with schisms, conflicts, and wars. Tolerance is not inherently a Catholic virtue. It’s still within living memory where heresy in the Catholic church is punishable by death. To this day, it marginalizes women even from its own ranks. Nuns are essentially second class citizens in the male dominated power structure of the Vatican. Hinduism has many gods, while Islam has only one God. Some Hindus may think Muslim God or Christian God is not suitable for their belief and practices, however some may embrace Islam or Christianity. Atheists don’t believe in God at all as known and defined by schools . Their population is so small even when compared with the least new Christian sect…its because Atheist have no real leader such as Jesus Christ or Buddha. They lack organization and hence no marketing, no books such as the Bible or Al Quran Al Kareem…. But no one knows the real belief of an Atheist. Deep inside they may have their own God, perhaps their God is the True God which most of the people doesn’t know. Perhaps they have the True God that provide them guidance to calculate a mathematical solution for a certain invention. They really don’t care about their status, no need for marketing…because they don’t come to church of a particular religion, or they are not believers and so they are Atheist as others described. Well, I think you escaped the point without addressing it. Let’s say organized religions are intolerant, which makes them divisive, and it also makes them unable to change. Then do you, the atheist, strive to cleave them from the human race, or what? I think it’s reasonable for the atheist to try to separate religion from public policy. To try to deny religion to those who believe that they need it is as wrong as trying to impose it on those who do not, IMO. Yes, I agree entirely, actually. If a church is a political action institution, it ought to pay taxes for the right. A church gets a free ride because it is considered to be doing charity work. Well, meddling with government is a far step from tending the spiritual and emotional needs of the flock. Not a believer too. And these large crowds scare the hell out of me. There’s no telling which direction the crowd may go. It may be positive or negative. I once went to a large meeting from a pyramid organisation and I couldn’t believe my eyes and ears seeing what, otherwise perfectly logical and normal people are able to change into when pushed by so called leaders and social control. I find the huge crowds for the Pope to be unerringly civil and enthusiastic. Hundreds upon hundreds of thousands lined up waiting hours for a brief glimpse and a few seconds of spiritual union that will last a lifetime. I don’t find that scary, but very invigorating. The troublemakers are small bands of people who insist on making the large bands bend to their will. I listened to the Pope’s talk both at the Palace and the Manila Cathedral, and I heard impeccable logic and goodness of heart, wrapped within his message of faith. I doubt that Binay gets it. So if I had to choose my lunatic, it would not be the Pope. These are the same crowds that hail Jesus entering Jerusalem only to shout days later, crusify him when in front of Pilatus. They behaved civic and patiently but just like with the black Nazarene from last year it can suddenly change. Thats what scares me. Crowds are a entity by itself. Yes, crowds can be scary, I agree. But I’d be inclined to give credit to the good behavior in respect of the millions of well-behaved Filipinos in Manila, rather than give in to the fear of bad behavior, usually caused by a few malcontents. At some time, in some way, we have to stop raising up the negatives as the ONLY thing out there, and give credit when it is earned. The only advertisement Atheists has is the failure of all Catholic countries in the world from the lovingly proud only Roman Catholic in South East Asia to the most Roman Catholic in Asia all the way to Middle East and Latin America. Vatican should be thankful to Taliban Christians 2,000 years ago who were more vicious than the current breed of Muslim terrorists. The Muslims has a lot of catching up. They should read and learn the wanton indiscriminate slaughter of non-believers that has forced the people of today to believe in this thing called Christianity. Even home grown Philippine God, Maharlika and Maganda, who were freed from a bamboo were smothered by forced marketing of Spains religion. The major emeny of Religion is internet and education. 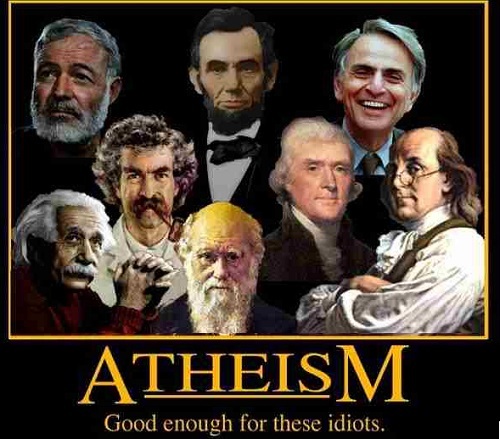 I thank the Atheists for all the good things that has come our way. Computers. Cars. Internet. Facebook. Etcetera. Atheists made the flat earth round. Have the earth revolved around the sun. That is a great feat. While the Vatican still sends their messages thru a chimney. I also thank the Vatican for giving refuge to jewish killers crank out false papers so they can go to Latin America and pray to their God. Even the leaders of the church pop pills cooked by atheists so they can live a little longer. I do not think the atheists are drunk of sorrow witnessing desperate Filipinos to see Pope Francis to drive away their sins but were amused and entertained. These fanatically religious Filipinos would leave the parade route of Pope Francis upon receipt of appointment to U.S. Embassy to get a visa to secular non-praying America. You are in good form today, Mariano. Science is what gave us computers, cars, internet, facebook, etcetera. Science is what made the flat earth round, the earth revolve around the sun. Religious beliefs and science are not necessarily mutually exclusive. ha ha ha ha amusing but it is true, US Visa is more precious than the pope…. imagine if we still believe that everything still revolve around the earth. wait how can that happen if the world is flat? Wait wait wait… Didn’t Al Gore invented the Internet? Watch your mouth you infidel! He might take it away! Thank you, sonny. Beautiful snippets yourself . . .
“… I find the huge crowds for the Pope to be unerringly civil and enthusiastic. Hundreds upon hundreds of thousands lined up waiting hours for a brief glimpse and a few seconds of spiritual union that will last a lifetime. A good souvenir … May I? For sure. Any time . . .
Lost in all the hoopla were portions of Pnoy’s speech. I’m referring to the portion of the Pope’s speech on corruption, and the shot of Binay. Man, I don’t know. It is the first such incident that I know of. Either I’m hacked or Word Press has poltergeists of mischievous aims or there was just an inadvertent mix-up twixt the typing and the receiving. If it did not go where you wanted, please try again where you want it. Yes, I was surprised at his candid talk. “Bold”, I said at the time. But I’m inclined to write about the silence of the entitled about a presidential candidate who ought not be a presidential candidate. It seems to be to be a lot like a quiet church in the face of a corrupt president. Three thumbs up for Pres. Aquino’s speech re Filipino clergy’s embrace of corruption in Arroyo’s time. Agree absolutely. It is amusing that the Catholic Pope essentially laid waste to the secular Philippines on corruption, and the secular President laid waste to the Catholic Church on corruption. The judgmental quality of a lot of the faithful appears to condemn the President, but not the Pope. I say praise them both. The critics are correct in pointing out how silly that wig reference is, but it’s doubtful if they understand that, to the Pope, it will reflect negatively on the clergyman who said it, rather than the president who complained of it. I suspect the reason for the complaints regarding PNoy’s speech is that, in terms of objective, his will have the desired result. On the yahoo blog it may interest our bloggers here that those who liked comments praising the President far outnumbered those that didnt like it. Itbtells us that the silent majority are indeed against the bishops. 1. I don’t feel sorry for atheists. 1.1. If they come from an initial position of faith and belief and have rationally thought out their position, then I admire them. They have done it tough. 2. Neither do I think that atheism needs a marketing department. To put it another way, the excesses of religion and fanatics serve as their marketing department. 2.1. The turmoil in the world, the corruption, the incivility, the mendicancy, the broken families, the abandoned wives and unsupervised children in the streets, the natural catastrophes… all of these should make every man pause and doubt his faith. 3. As to whether atheism is divisive, it would depend on the individual atheist. 3.1. There are atheists who are proud of their rationality and would treat believers with contempt. 3.2. But there are atheists who have evolved further and understand and accept that reason cannot invalidate the religious experience of believers. 3.3. I think most atheists live in the hope that believers will outgrow their superstitious faith. 3.4. Atheists have come to realize that ethics does not need religion as a foundation. 4. The Abrahamic religions are definitely divisive. 4.1. I think Francis is caught in a dilemma in his attempted pluralism. The impulse to be inclusive defines the man but his faith contradicts the impulse. 4.2. He denounces deviant religions but at the same time castigates those who would remove the deviancy from those religions. 4.3. His church is also caught in deviancy. 2. Yes, that’s true. Thanks for 3. and the sub-points. It seems to me that a truly rational perspective would embrace difference, for everyone is bound to their heritage and cultural upbringing, and also shaped by institutions such as schools and churches and governments. It is difficult for those hard-wired in a certain way to suddenly become rational, on our terms. I did not really see this until I recognized that 83% of the Philippine population is bound PASSIONATELY to a belief system that, what, 3% condemn them for having? Belief is not a democracy, but I think one has to believe that for 3% to condemn 83% is . . . well, I don’t know. Elitist? 4. I agree, they are divisive. I’d guess you have heard more that is divisive from the Pope than I have, in this brief visit. As people grow up with their own set of biases and visions of how life is supposed to be, I’d say Popes grow up within the Catholic system of ritualistic worship and doctrine set in stone by Moses or Charlton Heston or this synod or that. Changing the Catholic Church must be a little like slapping down one’s mother because she was uneducated about something. Pragmatically speaking, the Church will either adapt to modern knowledge or become irrelevant. I give Pope Francis credit for striving to make the church relevant. Which I presume to mean, doing good. And vice versa. I think we all need to strive to respect people for who they are. Be less judgmental of others. We all have our quirks and weirdness. They make us different from others. Everybody is unique, one of a kind. The awareness of diversity even within our own family or circle of influence could facilitate greater tolerance and compassion. Nicely said. I’d rather focus on the development of total respect for our humanity and our intellect, the combination of the two empowering us to figure out ways to live together in harmony. We all have soul. Faith enriches it. We all have brains. Respect that there are different ways to enrichment. Then we can jointly work on problems like global warming and over-population. The former being a problem mainly for the scientists (proxy for atheists), and the latter for the religious (proxy for the Catholic Church). 1. My favorite atheist is CS Lewis. A very honest man, sincere, open-minded, rational. Competent in philosophy and literature. 2. I think atheism has a very powerful marketing department. It’s cool to be an Atheist nowadays – that requires some marketing genius. 3. I agree. On both sides of Atheists and Believers, there are individuals who should be ignored. 3.4. Or they are still in doubt because they don’t have answers to their own questions. 4. How is Christianity different from other religions (including the Jewish religion)? It is said that it’s grace. The Christian God is the only God who give’s unconditional love. Just mention religion and expect that the situation would escalate right away. This is the reason I stay in this community, you can throw in that most controversial topic and everything is still in order. just for clarification, I thought C S Lewis died an Anglican. His book Mere Christianity is considered a classic for Christian apologetics. And that is my point, Sir. I think everyone would agree that CS Lewis is a very intelligent man. Many Christians quote him that’s why I assume he was not an atheist. Mere Christianity and The Screwtape Letters are the highly recommended readings by a favorite theologian. This I have to do. I won’t fare too well with The Chronicles of Narnia. Thanks. Sorry to confuse, was typing on mobile. CS Lewis is definitely a Christian. He was an Atheist who become a theist. I like his approach as he talks about Philosophy. Followers of Religion who kills people and destroy temples who oppose them are only those Fanatics. A good servant of God of any religion Judaism, Christianity or Islam does not hurt people. The Al Qaeda, Abu Sayaf and other terrorist groups does not belong to Islam, they are users, and perhaps being paid by millionaires to cause troubles to Islam. Islam is so attractive and easy to embrace, that is why a campaign such as Abu Sayaf, Isis or Al Qaeda are anti-marketing for Islam. You nail it exactly, Mac. There must be a higher power, for we exist, and there must be mystery, for we know not why, and there must be free will, for we exercise it, and there must be good, or there would be darkness. Joe, this creed works for me. Communism is also a religion. I treat it as such. Communism is an organization so as Religion, the difference is that, in Communism, one is force to give more that what it takes, while most religion ask only 10% of the income, some even says as you wish or as good to your heart….but really a lot of these organized Religions Ministers have become rich, so very rich….see Vatican’s wealth? What about INC and some other religions.. People are hungry of truth, do we have Heaven? Do we have paradise? Do we have God??? And the ministers says YES….but you need to share a portion or about 10% of your network….This is one reason, why different organization continues to grow and new ones shine with a different styles…. Since I am angry, therefore, I AM A BELIEVER. GOD HELP ME ! HAVE MERCY ON MY SOUL ! HOPE ONE DAY WE WILL MEET BEFORE MY JUDGEMENT ! I BEG FOR YOUR COMPASSION ! Straddling the divide, again, Mariano? Where is Joseph Ivo when we need someone to douse the fire and shout, “Moderation, people!”? The extremists are the albatross of any organized religion. There are good, middling, and bad atheists, let us discern the difference. No, let’s force them all into one bucket, like we do Muslims. You know, you make me realize that divisiveness is a failure to respect that goodness comes in all shades, religious or irreligious. Yet we obsess over the bad. Here’s a fearless forecast Joe. Humanity will evolve to reject any and all forms of belief in invisible gods. The future of humanity itself will increasingly depend on the tools and method of science and the scientists that employ them which are, by default, nonbelievers. The snake oil salesmen of religion will only be able to sell their wares to the poor and ignorant population of the world. In that sense, religion is the enemy, the harbinger of poverty and ignorance in humankind. It perpetuates poverty and ignorance by, among others, refusing to empower women on their reproductive health, because religion can only thrive in a teeming sea of poverty, suffering, and ignorance. I was reading yesterday that we humans have gone past the 40% mark on the way to the complete destruction of the planet, one of the most severe threats being the chemicals being dumped into the sea, extinguishing much of the life there in major “dead zones”. At some point, we get past science’s ability to pull us back. I think humanity will evolve to reject the weak, and if banding together by faith makes groups strong, they will outlast the atheists. Now, if the atheists band together and have better weapons, they will win. A small version of this is being played out in Iraq and Syria. Have you watched Interstellar? It is about earth’s imminent destruction and the film also has something to do with atheists.If the plot is to be folllwed, I guess when that happens we have to look for a planet suited for human habitat. I was disappointed with Interstellar, I had high expectations. It ended up to be a cut-and-paste version with portions from Capricorn One, The Black Hole, 2001 – A Space Odyssey, Star Trek The Motion Picture. The sub-plot beyond the wormhole went nowhere. That means that it will be the same thing all over again, survival of the fittest is maintained, and the status quo preserved. Nothing changed. Micha’s fearless forecast is negated, :). If humanity has a future at all, it will have to involve abandoning mother earth. Whether we like it or not, the flourishing of life on this planet is not forever. Human activity hastens planetary hostility to life. Even then, our sun will run out of helium to burn and will implode in a fiery gust before dying. We may console ourselves that it will happen several million years from now but that is exactly the future I’m talking about here. Your fitting of atheists vs. religionists will then become moot in such a future. What good will winning do for either of them if you don’t anymore have habitable earth? By necessity, humanity will have no choice but to unite, discard the divisive baggage of religion and summon all its energies and talents to explore the possibility of settlement in some habitable extra solar planet. That means employing more science and discarding the quackery of religious beliefs. Micha, I really believe you should read Fr. Stanley Jaki. You will enjoy what he has to say on Science and Religion. Don’t be turned off that he is a Catholic priest. I have only read his essay on the miracle of the dancing sun at Fatima. I am trying to get a hold of his book THE MIRAGE OF CONFLICT (between Science and Religion). It now reminds me of The hunger games saga. that was after bert’s comment.after micha’s comment back to interstellar. before our sun goes supernova , lets go back to what are the plans going on around the globe. According to my last visit in the mind museum, the scientists around the globe are dealing with rich sponsors to coordinate a project travel to the south pole of the moon where many believe that there are signs of life. That does not address the supernova scenario but we’ll get there somehow sometime. quackery is seasonal. geocentrism-heleocentrism, flat world – spherical world,name it you have it. When I was a kid, I have a lot of questions, I don’t stop until I’m provided with answers. I thought then that given enough time, I’d be able to answer all my questions. But no, the more I know, the more questions I have. As I learn more, I have to change the answers I already provided. When Mark Twain was a kid, he’s very sure his old man is the most stupid people in the world. And when he was 17, he’s astonished as to how much his father learned. Lucky guy that Mark Twain was. To learn what has to be learned that early. Some of us took a while longer. To learn that father knows best about life. I’m not sure that the path to the future is that linear, from religion through non-religion to science to other worlds. If we allow science to define ends, the future is not all that clear and straightforward. Dystopias in science fiction abound. Some of these describe worlds of unintended consequences where scientists have become rogues and science has gone mad. There is Huxley’s “Brave New World” for one. I am currently reading “Mockingbird” by Walter Tevis. The book portrays a future wherein robots, created as the servants of man, have become his overlords. As well, I am not too sure that mankind should not be allowed to go the way of dinosaurs. Personal extinction is assured. Are we so superior a species that collective extinction should be warded off? Not too long ago we lived in a world of immediate mutual assured destruction by nuclear force. Today we live in a world of prolonged destruction by other forces such as climate change and religious fundamentalism. The supreme irony is that both worlds — yesterday’s and today’s — are the product of our need for security and comfort. And Micha’s tomorrow-world of escape into space is also a product of such need. The escape will not be an easy thing. To be sure, there are plenty of habitable planets within the Milky Way Galaxy. We will have to colonize our solar system before we venture farther. And then we will have to contend with the possible collision between the Milky Way and Andromeda within 4 billion years. As to survival of the fittest, who are the fittest? Aren’t they the ones who would do anything, use any means, to survive? Perhaps we look too much to tomorrow. Perhaps we should look to today and appreciate the blessings of the day. Yes, it was nice and cool. I would love to have seen you climb to the tops of the trees. Perhaps we do look too much to tomorrow. And too much to the past. 🙂 Caduceus, the symbol of medicine. Golden fleece, what Customs does to you if you try to import anything. The healing symbol for the Society is definitely not far-fetched at all. Pardon me for being a tad cryptic, Joe. I meant the caduceus to mean Mercury as the messenger of the gods and the golden fleece as Jason’s symbol of authority and kingship as the ancient myths would have them. Arbitrarily I reassign the dissemination of information and pursuit of good order as what the Society stands for.in those two symbols. 🙂 It’s just my mind meandering. Haha, I guess I missed on both definitions. Meander in peace . . .
Ha ha I like the Customs as the golden fleece too. As far as species go, yes we are both lucky and privileged to have acquired higher consciousness and intelligence. Collectively, methinks it’s not a question of whether mankind should be allowed to go extinct or not. It’s just a function of a natural desire to survive. The difference between dinosaurs and modern man is that the dinosaurs were not aware that big rocks could also fly. Granted, the biological drive to survive is strong. But consciousness can thwart and even suppress the drive. And to ask the question is a function of rationality. Should biology dominate rationality? Or should it be the other way around? For humans, rationality is as much a given as biology, and it is rationality as much as biology that makes us a superior species. There’s no duality. Reason is a by-product of biology. We are matter which became conscious of itself. There is more than duality. There is multiplicity; there is plurality. When I say that consciousness can thwart or suppress biology, I am not saying that consciousness is the opposite of biology, only that consciousness in the form of rationality can overcome or control biology. Neither can one say that consciousness (or rationality) is a by-product of biology. By-product means an incidental or secondary result. Biology may be the matrix of consciousness but consciousness is not a secondary result. Consciousness is inherent in biology. Biology pertains to living organisms, and all living organisms exhibit consciousness to a degree. We do not know as yet that non-living organisms possess consciousness. Not really sure what you meant by overcome or control. I am essentially employing reason and consciousness here as synonymous to man. Just as man emerged from the process of biology, so too did reason. In that sense, it is an epi-phenomenon. 1. “There is multiplicity; there is plurality”. 1.1.1. In the above statement, Micha implies that I consider biology and consciousness to be a duality. 1.1.3. Therefore by plurality I mean plurality of views. 2.4. Note that in the expansion I foreshortened “biological drive” to “biology”; within the context of the discussion, the foreshortening should be acceptable. 2.5. An example of “overcome or control” of biological drive is: celibacy. Another example is: dieting. 3.1. Micha’s original statement of “Reason is a by-product of biology” introduces a duality. That is, reason is separate from biology. 3.2. I reject the duality. My contention is that consciousness (or rationality) is not a by-product of biology. Thus: Consciousness is inherent in biology. No it does not, because you cannot separate reason from man. You may just have been waylaid by my use of the word “by-product” which could be, for purposes of clarity, replaced by “emergence”. That is, reason (man) emerged from the process of biology. I guess that’s where the confusion came from because, dear edgar, we were not talking about “views”. The subject was emergent property of reason and consciousness in man. So, we agree on the non-duality of things. That’s good. Moving on, moving on. Aha, you’re existentialist slip is showing. I grew up in a country where all they did is “marketing” and forcing their atheist agenda on us. I dont have any petty on them and I’m happy to take a break from them. that means this community is mature and civil . I hope I can be as mature and civil as the rest. “…respect granted generates respect in return” is another way of saying love your fellowman as you love yourself. That is the basic principle I live on to find the peace within myself that so many find hard to understand. By the way, I am a free thinker who believes that there is that spirit inside me that enlivens and animates me to think of better ways to make this world a better plqce to live in. Very good, gerverg. I for sure respect that. In his heart of hearts, in the deepest rung of his soul, Pope Francis is not a believer. Pope Francis plays upon the fifth stage. He started off as a strict authoritarian, a reactionary figure. At age 50, Francis underwent a spiritual crisis from which, says his biographer, he emerged utterly transformed. He ditched the trappings of high church office, went into the slums and got his hands dirty. I now see the importance of comment threads, this comment thread in particular. Lastly I like hearing from the bookworm types they are instant librarians to me. I have many e books downloaded from torrent I am just too lazy to read them maybe it is time to even have a glimpse. Which makes me wonder, in the context of this thread, are poets rational? I’d say they tend more to the religious, or spiritual, or meanings beyond words. Can there be an Atheist Poet’s Society? this proves I watch movies more than I read .i know there is a dead poet’s society,but somewhere out there is a league of fine gentlemen and women. Ha, does it star Sean Connery? Right, for Dead Poets. “League of Extraordinary Gentlemen” was Connery. 2. in france, drawing a picture of mohammed is entirely legal. it’s the muslims (extremists and moderate) who were led to believe that this was haram for them from the beginning, and justify responding to this with violence. 3. atheists do not need pity; apart from having the inconvenience of living with religious people (especially those who do not know their limits), we’re fine. 4. atheists do not have a pressing need to get converts. like in the matrix, we just become aware and leave. some go back to being religious, but we do not chastise or hurt them for that. it’s the religious ones who do this, instead. 5. related also to item 4, atheists do not need a marketing department. if you cannot see the advantages of atheism, then maybe you’re fine where you are. and we’ll leave you there. 6. atheists are not getting drunk just because of this. it’s just mind-boggling to us why, after centuries of existence, the pope’s example hasn’t stuck, or why you needed such a pope to show you such simple examples after centuries of existence. 7. as for the large questions, like what is beyond the universe (if even that question makes sense)? better to say ‘i don’t know’ than to propose an emptiness of an intangible being as an excuse. 8. atheists are not diminished by this. in fact, we’re a bit entertained by this.. show. Don’t read the language too literally. Strive for the meanings. Your view again causes me to ask, is atheism inclusive or divisive. It was not a show to those crying over lost loved ones and searching for a reason why. The atheistic view might be, it’s statistical, deal with it. Well, that is reason, I suppose, but it is not compassion. A visibly moved Francis said he had no answer. “Only when we are able to cry are we able to come close to responding to your question,” Francis said. My take is that Francis — and Christianity — does not have a real answer to Glyzelle’s question. Francis’ answer was a non sequitur. One stock answer I have heard before is: “Because God loves us. He makes us suffer so that we may know Him.” Which makes God a sadist. Suffering (especially of the innocents) is the albatross of religious faith. Suffering in spite of a supposedly all-loving, all-knowing, all-powerful god does not make any sense. It contradicts all claims of faith. This quote by Epicurus might not actually be by Epicurus, but Epicurus had enough material for atheists/agnostics. Epicurus was not technically an atheist. He was more of a deist. But his arguments against religion/superstition stemmed from the fear of death. For a christian, it’s fear of going to hell. Yes, a real atheist, a sleeper if you will, who positioned himself at the center (or is it at the top) of the hierarchy, to awaken the flock from their superstitious stupor. I wonder what the Vatican will do if they find out, :). Most people in the Vatican, if they are as intelligent as Glyzelle, are also non-believers. If you are God, will you, limit the freedom of your creation? It is written in the Book of Prophets and many other books in the Bible, in Al Quran Al Kareem, God created humanity to serve by that finishing the term appointed. One may become a President or maybe a prostitute, depends on the selection process as we grow older. Within this time frame, one should be able to know his/her CREATOR…once one have that knowledge, automatically he/she will recognize serving God. When the appointed time comes knocking at your door and you are still without knowledge who the CREATOR is? Your spirit will leave your body, by then its too late. Your spirit will travel back to God and you will realize, you missed that knowledge. Your spirit will have to wait for the Judgment Day, where in every spirit will be given new body, that day, its up to God to forgive for He is the Most Merciful…those who have believed will be right away in the Paradise…. In Heaven, there is the Throne, quarters near the throne, then so on and so so distance, but the unbelievers will dwell far far away, the Book of God says in a Bottom Less Pit…with fiery atmosphere…. It is like in the Movie, however, Al Quran Al Kareem were written during the time without paper and pen, but the view was already mentioned 500years later after Jesus went to Heaven…. If Francis is not wedded to his office, if he had just instead chosen to remain as a chemical technician and bar bouncer in Argentina, he would have no trouble answering Glyzelle’s question.